Security holograms are designed to combat counterfeiting. Their unique optical properties to diffract light and create virtual 3D effects are impossible to copy using a scanner or photocopier. Holograms are a deterrent to counterfeiters. Because holograms require specialized equipment and technology to make, counterfeiters tend to avoid products which are protected by holograms. Because of their unique optical properties, holograms are quick and easy to validate. Hologram labels can also create a unique and attractive complement to your existing packaging and product. Research shows that consumers perceive a higher value for products protected with holograms. Consumers believe manufacturers who use holograms care more about the quality of the products they produce. NOTE: Our holograms are designed and tested for anti-counterfeiting, anti-tampering and promotional applications. Our holographic products do NOT provide any documented medical benefits. In our opinion, claims of medical benefits are questionable and unsupported. Consumers should request an independent clinical study (with blind testing) to verify any medical benefits. Following is a listing of current applications for holograms used throughout the world. This is intended to show the prevalence of holograms as a proven method for combating counterfeiting and providing product authentication. NovaVision does not produce all the applications shown. Holograms are used on a wide variety of projects where security needs range from low to high security. Some low security security projects would typically use a stock hologram. As security needs increase, additional customizations would include serial numbers, custom imprints, custom hologram images and hidden security features. With the continued rise in counterfeit branded products, more corporations are using custom holograms to protect their brand and corporate image. Many of these capabilities are available as a stock product or they can be added as an optional feature on a customized hologram. If you have little or no security protection now, any hologram will improve your situation. 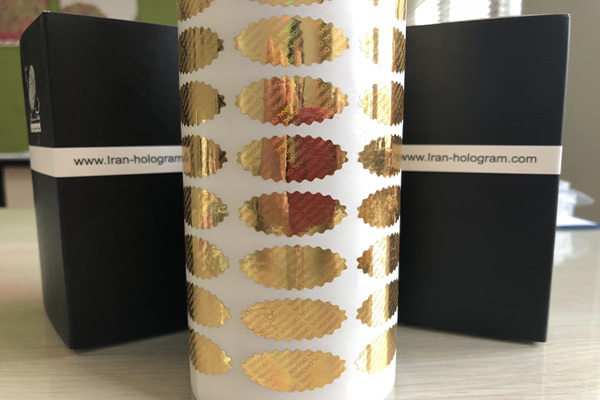 Stock Hologram Stickers without custom imprints can be effective, especially for one-time events where using a generic hologram sticker, which is also sold to other users, still offers appropriate security. Also, a customized imprint is NOT required on our Stock Transparent Holograms, which is another affordable option. If you use the same hologram image repeatedly over several weeks, months or years, then you may want additional customizations on the hologram. Some of our Stock Holograms include unique serial numbers which will provide added security. Another option is to imprint your custom text, logo and/or serial number onto any of the Custom Imprinted Holograms. The best security is to create a custom hologram image. In this case, your custom text/logo is integral to the holographic image. Although a custom hologram image has high initial expenses, for projects of over 100,000 labels/year, it often is the lowest cost option longer term. See our Radiating Globe image with serial number and UV fluorescing ink; although a stock image the serial number is unique and the UV fluorescing ink is a hidden security feature which is visible with a UV black light. This image is available on same-day EXPRESS service and requires no other customizations. This feature is also available as a custom imprint on any stock or custom hologram. Our Genuine Authentic stock labels have two hidden security features: microtext (viewable with magnification) and a hidden image which is viewable with a laser pointer (both Green Laser or Red Laser). To our knowledge, this is the only stock hologram image in the industry which has both hidden micro text and a hidden image readable with a laser pen. This image requires a custom imprint and usually ships within 5 days (optional RUSH service is available). Either of these optional features can be included on a custom hologram. For custom holograms, we offer machine readable taggants. Taggants are invisible to the naked eye, but can be machine-read to quickly and reliably identify and authenticate products. Any of our hologram labels can be custom imprinted with serial numbers, custom text, logos in single colors or multiple colors. We also have a silver holographic ink and a hidden ink only visible with a UV black light. We also offer 10 stock background colors. Any of these features will further enhance the security of your stock or custom hologram image. Changing features adds security — change the background color, change the color of the serial number, change the format of the serial number, etc. 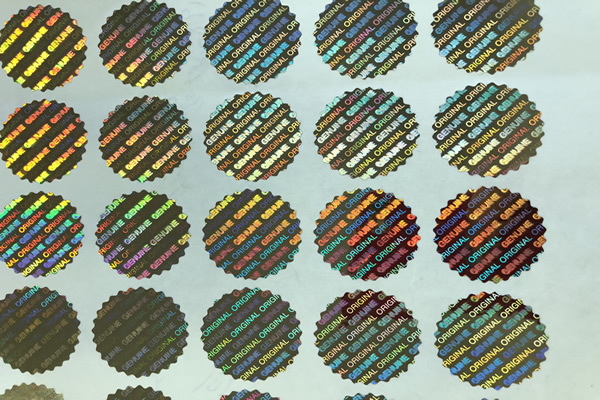 If you need material the same day, see the Stock Hologram Stickers. All of these holograms are available in same-day EXPRESS SERVICE. Place your order by 2pm EST and the holograms will be shipped the same day. Our Stock Transparent Holograms are also available for immediate shipment without the need for customizations. Customizing a stock hologram with an imprint of your custom text, logo or serial number normally requires 5 business days. However, these products are available with optional RUSH service. Creating a custom hologram image and then producing custom labels normally takes 30 calendar days on the initial order. Optional RUSH service is available (call for details). Repeat orders of custom hologram labels are typically produced within 2 weeks. Pricing discounts begin at 25,000 labels. Please call for special pricing on any stock or custom order of 25,000 labels or more. 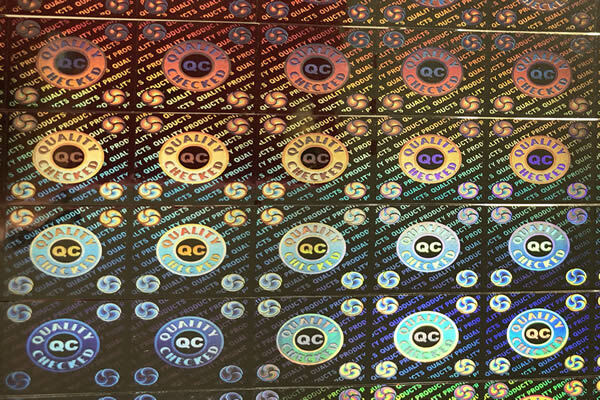 If your order quantity is 100,000 labels or more each year, you should consider a custom hologram. Although a custom hologram image has high initial expenses, for projects of over 100,000 labels/year, it often is the lower cost option longer term. For most projects of 250,000 labels/order, a custom image will be lower cost. If you are a bargain hunter or your budget is extremely challenging, please call us to inquire about unpublished special pricing. We occasionally offer holograms with cosmetic blemishes in the finish. Functionally the holograms performance is the same, but a visual defect results in a price discount. Often the visual defects are very small and could be acceptable for your project. Discounts for holograms with cosmetic defects begin at 10%. We will provide free samples so you can verify the holograms are acceptable for your project. We offer both silver metallic and transparent holographic materials. We also offer holograms with color metallic backgrounds. All of our holograms feature a bright embossed hologram image. Most of our hologram labels use dot matrix technology instead of 3D or virtual depth. Dot Matrix holograms are brighter under all lighting conditions (virtual depth images are only visible in excellent lighting). Dot matrix holograms are more visible because they have a wider viewing angle (virtual depth images have a very narrow viewing angle). Most of our security holograms are tamper evident; after initially applying, any attempt to remove the hologram sticker will self destruct the hologram image. We have over 10 stock sizes and shapes. We also can produce custom sizes and shapes. For the customized imprint on stock holograms, our standard process is to print custom text, logos and serial numbers on the surface of the label using thermal transfer resin ribbons. These thermal inks are durable to mechanical abrasion, scratching and most liquids. However, thermal printed inks can be removed with certain solvents such as gasoline, alcohol, or lotions containing alcohol. Holograms on ID Badges where the unprotected imprint is exposed to excessive handling. Season Passes for water parks, beaches, or other applications where suntan or sunscreen lotions are prevalent. Bar codes are not readable on top of a silver metallic or transparent holographic image. However, locating the bar code on a white background on part of the hologram label will result in a readable bar code.